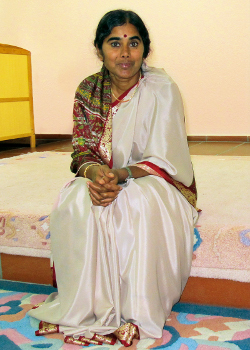 Mother Meera gives blessing in silence. The Darshan event with Mother Meera follows a precise structure, original to her work and exactly suited to allow the transmission of the Light she brings down upon the earth. For a little moment, while she touches our temples, she is working on something that might be described as the ‘wiring’ of the soul. In her book, Answers, she describes an inner system of subtle energy in the human body that reaches from head to toe. By the process of incarnation and the entanglement of body and mind with worldly influences these subtle channels of energy can become knotted or blocked. During Pranam (‘bowing down’) Mother very delicately works on these knots, gently freeing-up the blocks preventing spiritual development. This process has to do with the soul and its unfolding and Mother Meera says that only Divine personalities can do such work. When Mother releases our heads we sit back and she looks into our eyes. This is Darshan (‘seeing’, here ‘seeing the Divine’). During Darshan, Mother is working on our ‘personalities’, the everyday body/mind. She searches for areas in our being where her Light is specially needed, giving us energy, purification and inner healing– whatever is required for the mental, emotional and physical aspects of our being to live in harmony. Mother’s poise and quiet demeanor sets the atmosphere of the encounter quite naturally, so the group present at Darshan is always contained and self-reflective, in harmony with Mother’s silent field of force.